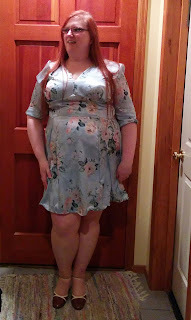 I made Sew Over It's 40s Tea Dress. I've had the pattern for a while. A couple weekends ago I taped it together and graded it up two sizes. 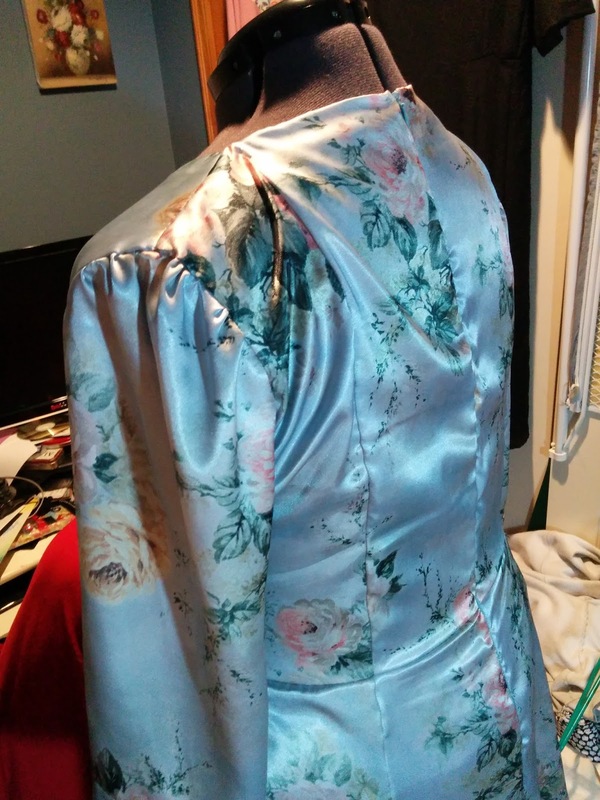 Then I cut it out of a light blue floral satin from FFC that I had purchased with the intention of using it for a muslin for another dress. But plans changed, so I thought it would be good for a wearable muslin for this dress. I sewed it up this past weekend. I graded up the pattern by just increasing each pattern piece by the same amount as the difference between the largest size and the size two below that. It worked out pretty well, but I think I still need to do an FBA. The seam that connects the bust pieces to the waist is too high. I even decreased my shoulder seam allowance to 3/8 in after I tried the bodice on. That helped a bit, but I still need some adjustments there. The dress was shorter than I expected. I actually think the length looks good on me, but I have a (wonky) tiny rolled hem. I didn't dare do more than that. So my next version will be lengthened. The sleeves are too tight for my massive biceps (read: fat arms) even after reducing the seam allowance there as well, so I need to fix that for next time. I'm not sure if I like the puffy shoulders. I need to wear it more and think about it a bit. I hate the neckline facings. I wore the dress out last night and they kept flipping up. I tacked them down a little more last night after I got home, but I think they are going to still be a problem. 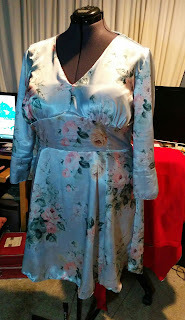 Here's a photo on my dress form after I tacked the facings down and ironed them extra long. Once on my dress form, I also noticed some odd pulling on the back of the left shoulder. I clearly did something wrong, because the other shoulder isn't like that. 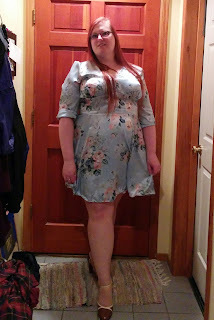 Overall I really like the dress and will make at least one more with the noted alterations. It's a really cute dress, love the fabric and the silhouette, looks great. Thank you. I'm looking forward to making another one with my adjustments. I just wish I had more sewing time to make All. The. Things!